Every few months tensions flare at Collins Street, Melbourne as the latest development proposal is floated. Once again, the Victorian Planning Minister has intervened at Collins Street. This time to prevent the construction of an 82-storey skyscraper opposite the Rialto Towers at King and Collins Street. As journalist Clay Lucas relays, this is a story of political intrigue, a web involving developers, financiers, and both major political parties–quite typical for Collins Street. In this case, we Melburnians might stop for a moment to reflect on the past in order to look forward. 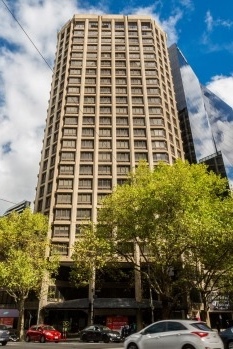 After all, the skyscraper proposal–which echoes the Rialto Towers–is for Enterprise House at 555 Collins Street: an important address for Melbourne. As Melbourne’s premiere thoroughfare since the 1850s, Collins Street has been the focus of much controversy in Melbourne. From the 1880s, commercial fortunes were sunk into impressive buildings, which outlasted the bankruptcies of the various entrepreneurs. In the 1950s, the 132-foot height limit was abolished in Melbourne’s CBD, and so dawned the era of the Melbourne skyscraper. As historian Ben Schrader has argued, Melbourne might have chosen the low-rise urbanism of Paris and Europe, but instead opted for the high-rise urbanism of Chicago, New York and North America. The American skyscraper architects came to Melbourne, working on towers for Shell (1960), BHP (1973) and AMP (1969). To make way for this redevelopment, demolitions were required. As Robyn Annear recounts, 1972 was the ‘Year of the Wrecker’. 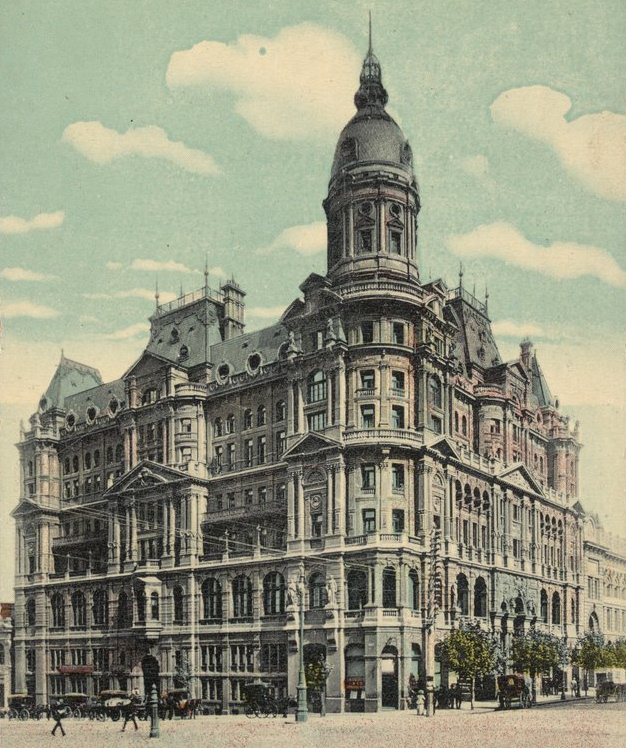 That year the incredible Federal Coffee Palace was demolished. In its place rose the modernist, concrete Enterprise House. At 555 Collins Street. Enterprise House. (Chris Hopkins for the Age). The Federal Coffee Palace for Enterprise House became a symbolic focal point for Melbourne heritage activists. Previously, there had been little vocal activism over Collins Street. Subsequently, the National Trust, the short-lived Collins Street Defence Movement, and the construction unions (via ‘green bans’) saved some notable places. These saved places included the gorgeous dome of the CBA Bank, the Regent Theatre and of course the Olderfleet and Rialto buildings. The latter two were ultimately saved as part of the ‘heritage compromise’ over the Rialto Towers. The impact of this activism was greater than saving a handful of buildings, however. At Collins Street, historian Graeme Davison wrote in 1991, ‘Melburnians would be persuaded that historicism—the illusion of pastness—was an adequate substitute for history.’ What is (ultimately) being suggested here is that Melburnians developed their approach to urban heritage–that often tense relationship between the historic environment and development–on Collins Street. 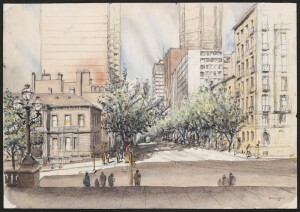 Collins Street from the steps of the Old Treasury Building, Spring Street, looking west, Brian Lewis, 1978 (SLV). 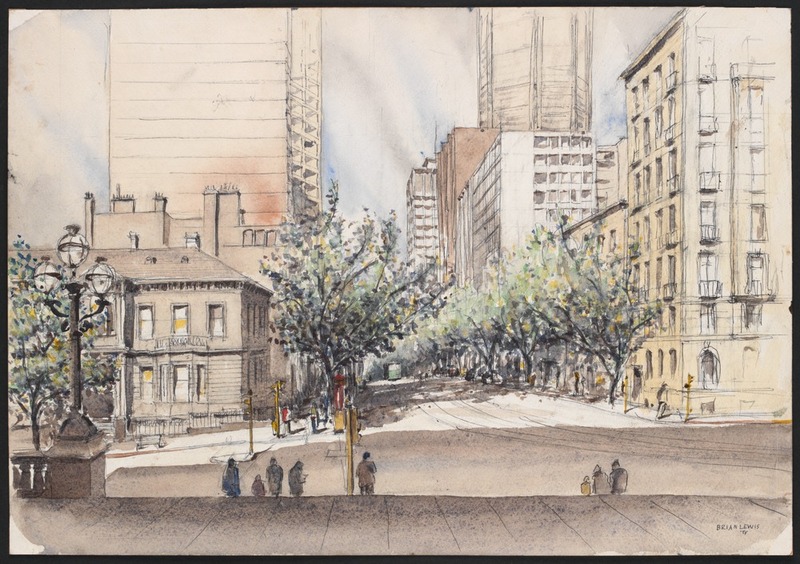 Today– Walk the full length of (historical) Collins Street from Spring Street to Spencer Street. From the grand Old Treasury Building to the contemporary Age/Fairfax headquarters. Rather than looking through the windows at ground level, look up. From the second story, there are some incredible sights to see. A fusion of nineteenth-century Victorian tiling, brickwork and ornament, and modernist and contemporary glass, concrete and steel. The legacies of nineteenth-century, twentieth-century, post-war and more recent Australian CBD urbanism. That play between new and old defines Collins Street, and has done so for more than 50 years. There is no going back to the 1970s: Collins Street is what it is: an awesome hybrid commercial space. This refusal to allow the demolition of the 1970s Enterprise House for a new skyscraper is in many ways fitting. Not because Enterprise House must be saved, nor over concerns of overshadowing and amenity. Certainly the proposal will be reworked and a contemporary skyscraper will ultimately be built. Rather, it is fitting because its planning refusal offers a short reprieve to consider what kind of Collins Street–and city–we really want. What kind of development? As happened at this site 555 Collins Street in 1972. Great piece for filling in the history of planning in Collins St and how the debates about heritage have played out. development by a member of the National Trust stepping in and buying it himself. ( as I understand it anyway). We already have a glut of badly built and too small high rise apartments in Melbourne , as well. Yarra river thank you very much Chris Wynne you have integrity. Strangely the National Trust did not oppose demolition of the Federal Hotel at 555 Collins St….possible Melbourne’s greatest architectural loss. I have heard/read that there was a fight over the Federal, but if there was, the Trust wasn’t part of it. Pretty sure they didnt even have a file until I created one, or maybe it was even later as part of the Lost! iPhone app. Have you found any evidence ? Hmm actually think maybe there was an early mention, maybe ‘unclassifyable’ because it was too ornate, not ‘good’ architecture. Certainly no fight like the CBA bank, the Regent, No1 Collins and Tasma Terrace, which all happened at the same time.